Royal jelly honey is a secret of the pharyngeal and maxillary glands of so-called “hive”, unflying, young bees in age from five to fifteen days. Along with honey, propolis and bee bread royal jelly is one of the bee products. 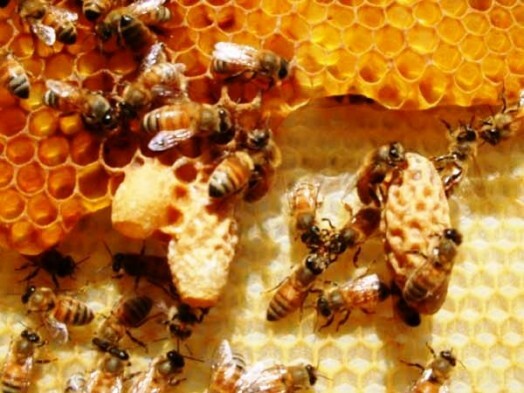 Royal jelly is the only food that bees make for the queen. 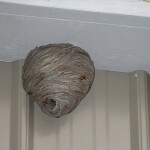 It is a powerful energetic, allowing the queen to lay the number of eggs exceeding the weight of the body of the queen itself. Jelly is given to all the larvae of worker bees up to 3 days of age. Because of it, the weight increases of 1,500 times at the end of the third day! A queen larva generally increases its weight of 3000 by 5-6 days! 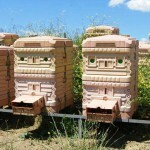 After the third day future worker bees begin to be fed a mixture of pollen and honey. 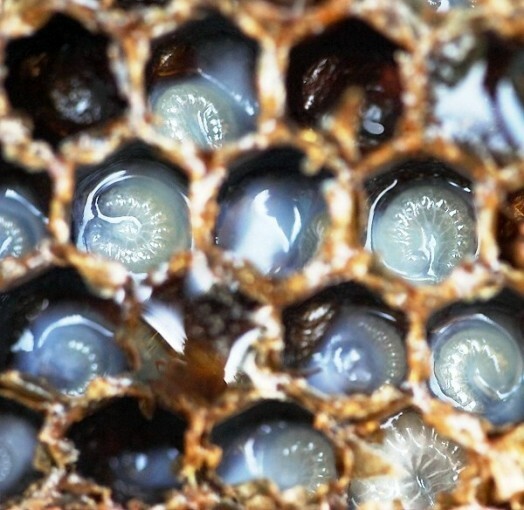 Future queen also receives only royal jelly – because of it, the queen grows at 2.5 times the size of a normal working bee. Japan conducted extensive study on the restoration of the body after the atomic bombings of Hiroshima and Nagasaki. In the course of their implementation, it was found that the most effective way to restore the body is eating royal jelly. 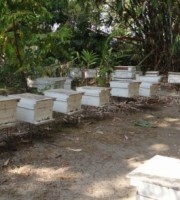 And now all over Japan all children eat royal jelly 3 times a day in kindergartens and schools. Royal jelly is similar to sour cream of white or cream colour. 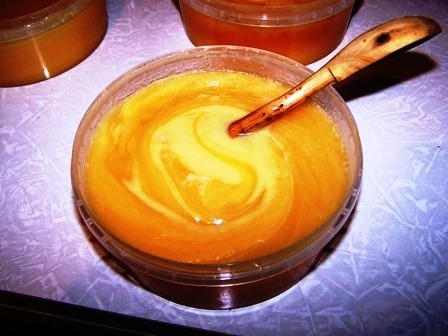 The real royal jelly has a pleasant pungent sweet and sour taste. Unique is the fact that about 16% of its composition is still not understood. Its amino-acid composition is identical to milk, meat and eggs. However, there is much more lysine, glutamine, proline and aspartic acid in it. It has also a gamma globulin , which has antibacterial, antiviral functions. This product contains B1, B2, B3, B4, B5, B6, B7, B8, B9, B12, 22 amino acids (part of which – essential). Its composition varies depending on the honey plants, but in any case there are such important elements as blood iron, zinc, manganese, cobalt and gold, potassium, magnesium, sodium, calcium, phosphorus, silicon. 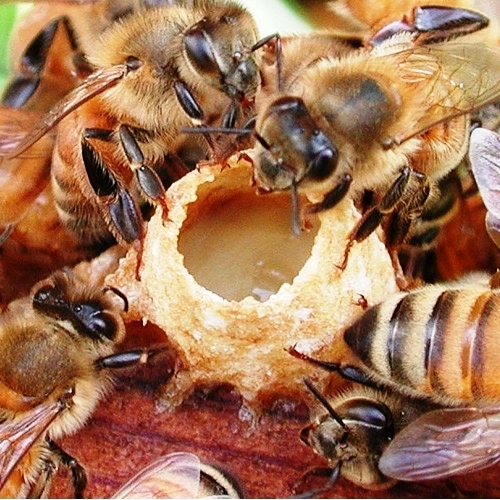 Overall, the Royal jelly contains more than 400 different substances. Table 1 – Composition of royal jelly,% of dry weight, except humidity. Table 2 – Percentage of free fatty acids. Table 3 – Vitamin content in royal jelly. 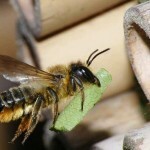 Royal jelly has excellent qualities for trophic of tissues. It significantly increases metabolism, improves breathing of tissues. Because of this protein synthesis greatly accelerates. Another feature of royal jelly is to improve the uptake of oxygen by the human brain, which significantly improves the brain activity of man: it decreases drowsiness, improves attention and memory, ability to work. Royal Jelly has huge reserves of energy, so the synthesis energy of ATP of man is greatly improved when it is used. It is especially useful for infertility! Very interesting is the fact that the product is self-sterilized and kills many bacteria. So, it treats anthrax, dysentery, typhoid fever. Royal jelly solution based on alcohol treats flu. It is useful against the swine flu. 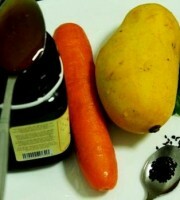 This solution also improves prostate, helps to clean the human body from heavy metals. The Japanese especially appreciate the product, and this is not surprising, as Japan is still (thanks God) is the only country against which nuclear weapons were used. As a result, the country is faced with the question: “How can we help hundreds of thousands of people whose nervous and immune systems were severely affected by the bombing?” And the answer was found: the royal jelly. Royal jelly has substances, including gamma globulin, it is a powerful immunomodulatory agent, which normalizes the entire immune system. It has the strongest influence neurotransmitter that improves the transmission of nerve impulses from nerve cells in the synaptic space between neurons, and thus significantly enhances the brain and spinal cord. As we mentioned, it is remarkably improves trophic tissues, activates the ATP activity, which increases the efficiency of the brain. Thus, it is simply irreplaceable for radiation damage of the body – no wonder Japan itself produces a large number of royal jelly, and buys it at times more! According to some sources, Japan buys 90% of world production of royal jelly, so maybe that’s why they have the longest lifetime in the world? 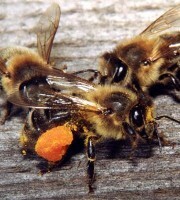 The use of royal jelly. The use of royal jelly must be made with care. Excesses (overdose) may lead to disastrous consequences. Below is a folk collection of the application of royal jelly. Check with your doctor before using the recipe! Be sure to read the contraindications to the use of royal jelly. 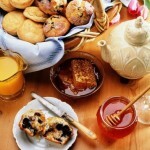 Flu: Take five grams of honey and mix it with bee bread in the ratio of 2 to 1. Then add 10 grams of pollen and 0.07 grams of royal jelly (ask the pharmacy to prepare the mix, so as not to disrupt the weight ratio of the shares). Use this in the morning for 20 days. Also, you can use the product 20 – 40 mg daily for 2-3 weeks. Similar effect can be achieved by applying the solution of royal jelly and alcohol in a ratio of 1 to 20 (to be used for five – ten drops before meals 4 times a day). Prevention of influenza: add 18 milliliters of forty percent alcohol to the 2 grams of royal jelly. Use half an hour – an hour before eating, showering the mouth and throat. Angina: you can use ten to fifteen milligrams 2-4 times a day for two – four weeks. Exhaustion and menopause: use royal jelly mixed with honey (100 grams of honey and 2 grams of royal jelly) every morning. Diabetes. Single dose of 20 mg tablets of royal jelly reduces blood sugar levels after three hours at 11-33% of the original level . Hypertension and hypotension: put 20 mg of royal jelly under the tongue 3 times a day for ten – twenty days. Asthma: 1 part royal jelly and 2 parts of forty percent alcohol. Use five – ten drops of it with milk for twelve – eighteen days. Contraindications: problems with the adrenal glands, idiosyncrasy of this product, acute infectious diseases. Do not use it at night because it has a strong stimulating effect on the human nervous system. Children usually do not give more than five – ten grams of pure royal jelly per day (adult dose should not exceed one hundred milligrams a day). Large doses of this product are only valid for the treating by a physician and under his direct control. 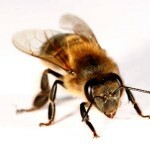 Remember that the royal jelly overdose can cause insomnia, overexcited nervous system, tachycardia, hypertension. Must be careful to use it if you have an increased clotting (coagulation) of blood. Dry royal jelly – a product of the processing (preservation) of fresh royal jelly, which, as we know, keeps the natural biological activity outside the hive for only 1.5 hours. Dry royal jelly is made by the following method. 1. Adsorption. Liquid jelly is mixed in a porcelain container with a homogeneous mixture of glucose (two – three per cent) and lactose (98 – 97%) in the ratio of 1:4. The resulting mixture is grinded until the mixture becomes completely come off the walls. Then dry the product in a vacuum oven without heating up until the moisture reduces to 2-3%. 2. Sublimation. 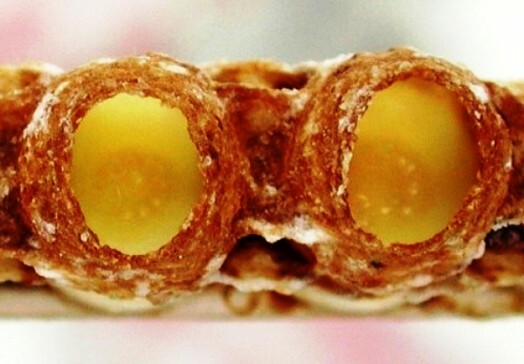 Fresh royal jelly is freezed for 2-3 hours at a temperature of minus 35 to minus 45 degrees Celsius (-31 – -49 F). Then place it in a vacuum oven, where sublime. 3. A royal jelly honey. 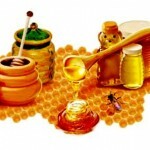 Since ancient times, beekeepers and pharmacists preserve the product, mix it with honey. 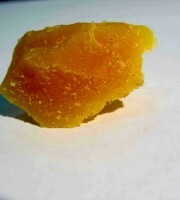 Dry jelly retains its biological activity for several years. However, the first described method is the best, because the product is most similar in its properties to the fresh one. Native royal jelly – the name of fresh royal jelly, composition, properties and application of which are described above on this page. 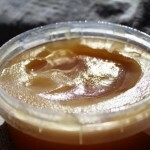 Native (fresh), royal jelly, as mentioned, remains the properties at room temperature for 1.5 – 2 hours.